Energy makes up the largest portion of the diet and is usually the most limiting nutrient in sheep diets. 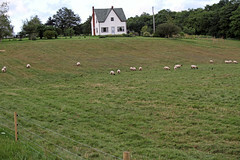 Carbohydrates, fat, and excess protein in the diet all contribute towards fulfilling the energy requirements of sheep. Carbohydrates are the major sources of energy. Concentrates (grain) contain starch, which is a rich source of energy. 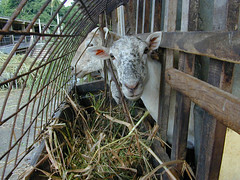 Forages contain fiber or cellulose, which is not as rich in energy as starch. 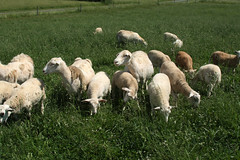 The major sources of energy in a sheep's diet are pasture and browse, hay, silage, and grains. Meeting energy requirements without over or underfeeding animals is one of the producer's biggest challenges. 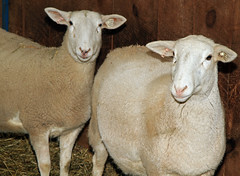 Energy deficiency is the most common nutritional deficiency in sheep. An energy deficiency will manifest itself in many ways. 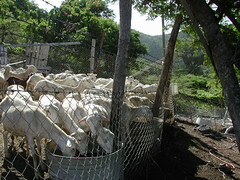 In growing animals, an early sign of energy deficiency is reduced growth, then weight loss, and ultimately death. In reproducing females, early signs of an energy deficiency are reduced conception rates, fewer multiple births, and reduced milk production. Energy is quantified in the ration in many ways. 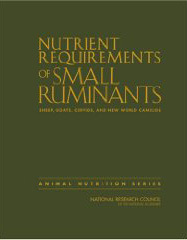 The simplest measure is TDN or total digestible nutrients. Metabolizable energy (ME) and net energy (NE) values are more accurate measures of energy in a sheep's diet. 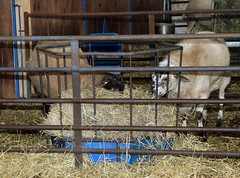 TDN is usually used to formulate rations for breeding animals, while the net energy system is usually used to calculate diets for growing lambs. Protein is usually the most expensive part of the diet. Since the rumen manufactures protein from amino acids, the quantity of protein is more important than the quality of protein in a sheep's diet. Protein requirements are highest for young, growing lambs who are building muscle and lactating ewes who are producing milk proteins. Calcium (Ca) and phosphorus (P) are interrelated in the development and maintenance of the skeleton. Deficiencies may result in rickets. An imbalance of Ca and P in the diet can cause urinary calculi in male sheep. 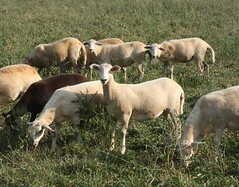 The calcium in most forages is usually adequate to meet the needs of sheep. 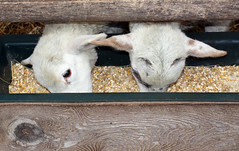 Deficiencies of calcium most often result when high-grain diets are fed. 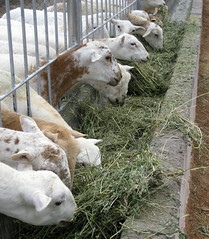 The ratio of calcium to phosphorus in the sheep's diet should be at least 2:1. 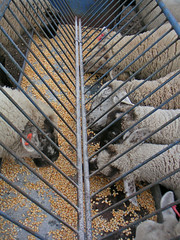 Fiber adds bulk to the diet and keeps the sheep's rumen functioning properly by increases rumination and salivation. Most ruminant nutritionists agree that sheep should always have roughage in their diets, at least one pound per head per day. 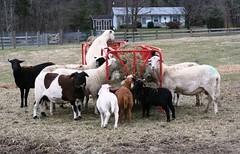 Sheep that do not consume adequate forage may chew on wood or wool. 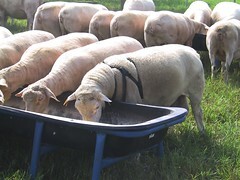 Water participates in nearly all body functions and is the most important "nutrient," though oftentimes the most neglected aspect of feeding sheep. A sheep will consume anywhere from½ to 4 gallons of water per day, depending upon its physiological state and the environmental conditions. Voluntary water intake is usually 2 or 3 times dry matter intake and increases with high-protein and high-salt diets. 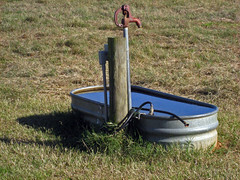 Decreased water intake may reduce milk production in ewes and growth rates of lambs. Animals than consume adequate water have fewer digestive upsets and a lower incidence of urinary calculi. A sheep's nutrient requirements for maintenance are the amount of nutrients it must consume daily to neither gain nor lose body weight. 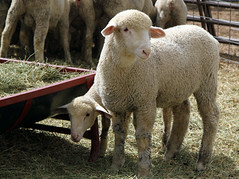 A sheep that is not pregnant or nursing lambs does not have very high nutritional requirements. 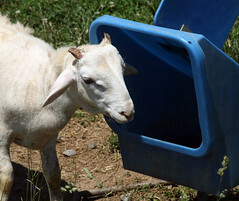 A ewe's nutritional requirements do not change during breeding, unless you wish to "flush" her. Flushing is getting ewes to improve their body condition prior to breeding. 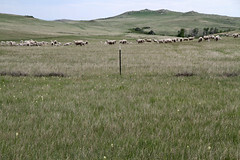 It is accomplished by providing supplemental feed (usually grain) to ewes prior to and during the early part of the breeding season. 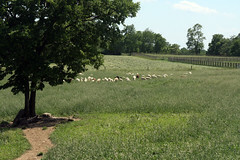 Moving sheep to a better quality pasture will also accomplish the same thing. Flushing increases ovulation rate and subsequent lambing rate; although, it is generally not profitable to flush ewes that are already in good body condition or to flush ewes when ovulation rates are already naturally high. A ewe's nutritional requirements during early and mid-gestation are only slightly above maintenance. While lower quality feedstuffs can be fed during this period, inadequate nutrition can have an effect on embryo implantation. A ewe's nutritional requirements increase substantially during late gestation, especially if the ewe is carrying multiple fetuses. This is because approximately 70 percent of fetal growth occurs during the last 4 to 6 weeks of pregnancy. 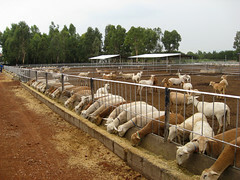 Adequate nutrition is also necessary to increase ewe condition to assure adequate milk production. 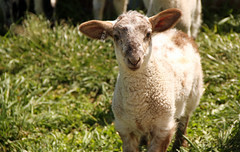 While ewes and lambs can survive at lower feeding levels, inadequate nutrition can result in pregnancy disease, lighter lambs at birth, increased postnatal losses, and lessening of mothering ability and milk production. 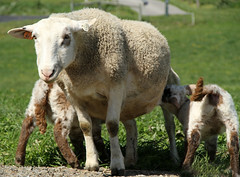 A ewe's requirements for calcium also increase during late gestation. A ewe's nutritional requirements are highest during lactation, especially if the ewe is nursing multiple births. 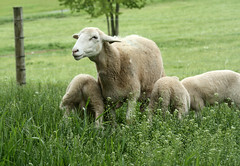 Ewes with twins produce 20 to 40 percent more milk than those nursing twins. There are other factors which affect a sheep's nutritional requirements: weather, shelter, activity, and body condition. 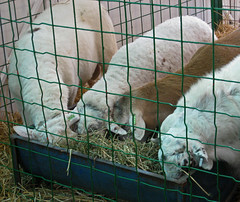 Below the critical temperature, livestock must expend more energy to keep warm. 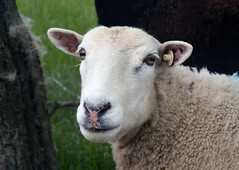 A sheep's critical temperature depends upon the length of its fleece. 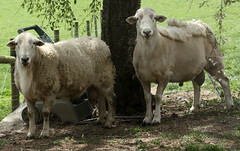 A freshly shorn sheep's critical temperature is 50°F. 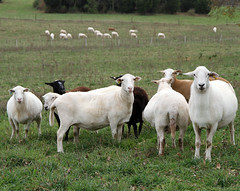 For a sheep with a 2.5 inch fleece, the critical temperature is 28°F. There is a 1% increase in energy requirements for each 1°F below the critical temperature. 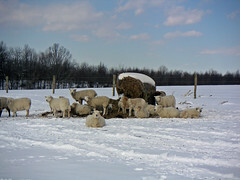 High quality hay is a better feed source during cold weather because more body heat is produced when it is digested. Late updated 22-Nov-2017 by Susan Schoenian. Copyright© 2017. Sheep 101 and 201.